Quiz: A patient has left main CAD and can be treated with percutaneous coronary intervention (PCI) or coronary artery bypass graft (CABG). Don’t worry, I’m not asking you to choose a procedure since our cardiology colleagues will take care of that. But, you should know the stroke risk with each procedure. Which procedure carries a higher risk of stroke? CABG per SYNTAX trial 2.2% vs. 0.6%, p=0.03, at 1 year. Does the lower stroke rate in PCI catch up to CABG in the long-term?Maybe. SYNTAX 5 year follow up 3.7% vs. 2.4%, p=0.09 at 5 years. Notice how the PCI rate of stroke went up (0.6 -> 2.4)? The focus of this newly published meta-analysis was to look at a larger sample size and determine if the stroke rates really do equalize between the two interventions after ≥1 year follow up. The authors identified 80,000 patients with more than half of the patients were followed 2+ years out. 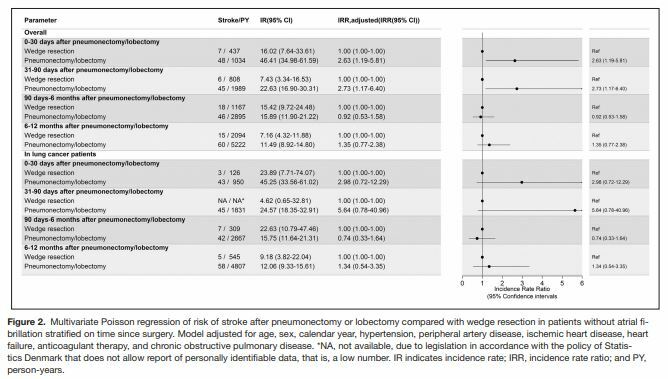 The PCI group persistently had a significantly lower cumulative stroke rate than the CABG group, even when looking at 1 vs. 2 vs. 3 vs. 4 vs. 5 years out. In the 5+ years group, there was no significant difference but there were only ~1600 patients. There was no significant difference among diabetics, but there was a trend favoring PCI. In looking at RCTs only, PCI did better in the 30 day perioperative period, but then had no difference with CABG in terms of stroke at 1 year. The authors suggest that the increased rates of stroke in PCI in the later period may be do to post-revascularization atrial fibrillation; or in my opinion, the ongoing vascular risks factors for the patient population overall. Bottom line for me: there are more strokes after CABG than PCI, even >1 year post-op. However, determining the optimal coronary intervention will be patient dependent and incorporate all-cause mortality, recurrent MI, target revascularization, and cost effectiveness in addition to stroke. Two weeks ago the Mexican Academy of Neurology (AMN) held its 37th Annual Meeting in the beautiful city of Merida, Yucatan, a culinary, musical and archaeological paradise. I was honoured to participate, along with Drs. Antonio Arauz, José Luis Ruiz-Sandoval and Marco Antonio Alegría, in a symposium on developing stroke systems of care organized by Dr. Fernando Barinagarrementería. Mexico is an upper middle-income country (GDP $1.178 trillion) with 121 million inhabitants. It has a long tradition of implementing public health initiatives and now has universal health care coverage. The life expectancy at birth is 77 years. But almost 20 years after the publication of the NINDS tPA study, <3% of patients with a stroke are treated with lytics or other acute interventions, despite the fact that 24% of patients arrive to the hospital within 3 hours of onset (almost half get to the hospital within 6 hours.) As in many other countries, including the US, many factors contribute to this low treatment rate, including a fragmented health care system, the lack of a coordinated EMS and in-hospital response, unavailability of lytics in some hospitals, limited access to imaging, poor knowledge of stroke signs and symptoms among the general population, and physicians’ fear about the risks of acute stroke treatments. But these challenges highlight several opportunities for intervention. The symposium participants and the audience agreed on the need to implement a coordinated system of stroke care in Mexico that involves the public, civil society, physician groups, first responders, hospitals, public health organizations and the government. I was encouraged to see that representatives from the Ministry of Health and the Seguro Popular were in the audience, and my hope is that they left the meeting with a greater awareness of the burden of stroke and the human, social and economic benefits of rapid diagnosis, transportation and treatment of stroke patients. The Mexican Stroke Association (AMEVASC) is the largest organization of stroke physicians in the country. It is a small but very active group whose members work together to increase public awareness of stroke and its warning signs, promote high quality stroke care in hospitals, and engage in stroke research. They have established national ischemic stroke and ICH registries and participate in investigator-led and multicentre international stroke studies such as IST-3 and SPS3. They have also developed practice guidelines for stroke treatment and prevention. All the speakers at the symposium (myself included) are members of AMEVASC, the organization that is leading the effort to improve care at the state and national level. At the end of the symposium participants endorsed the Merida Declaration, a call to action to physicians, hospitals, EMS providers, the public, NGOs and state and national governments to work together to develop stroke systems of care throughout the country. This is the first step in the development of a system of care that will identify stroke centres and promote the rapid and accurate identification of stroke patients, swift transport to hospitals, prompt attention in the emergency room, and access to effective treatments for patients with stroke in Mexico. It has long been apparent that the outcomes of all ischemic stroke patients are not alike, even those with remarkably similar occlusions found on vessel imaging who arrive in a similar time frame and receive similar care. “Good collaterals” are often pinpointed as a major factor that could cause these differences, however methods of effectively gauging collaterals have historically been time consuming or not available or possible in the acute setting. In their current article, authors Cortijo et al find that CT perfusion studies, specifically a calculated relative CBV (rCBV) may be an effective indicator of collateral flow, and thus may be useful in directing therapy in the acute setting. From 2009 to 2012, 68 patients were enrolled. All participants had to have an MCA–territory stoke, vessel imaging, a CT perfusion (CTP), and IV tPA therapy. TCDs were used to measure recanalization of occluded vessels after treatment. CT perfusion source imaging (CTP-SI) was used to score collateral flow, with values of 0-1 graded “poor” (<50% filling) and 2-3 graded “good” (>50%). rCBV was calculated by comparing the CBV of the affected hemisphere to the unaffected side. Collateral score was significantly associated with mean rCBV (p<0.001), with ROC curve-derived best cutoff values between good and poor collaterals found to be 0.93 (sens 70%, spec 87%). While none of the patients with a low rCBV (<0.93) had a good 90 day outcome in the absence of early MCA recanalization, 52.9% of the patients with high rCBV (>0.93, thus indication of “good” collaterals) became functionally independent despite having a persistent MCA occlusion 2 hours after tPA-bolus. Studies such as IMS-3 and MR-RESCUE have made a strong case that further delineation of ideal patient populations may be necessary to optimize outcomes post-stroke with intervention beyond IV-tPA. While this study has it’s limitations, such as a small sample size, it is promising that imaging modalities that are relatively fast and accessible like CTP may give us quick insight into the potential “durability” of a stroke bed, and thus give us some guidance as to whether intervention beyond IV tPA may be indicted. In the 65 years since the start of the Framingham Heart Study, our knowledge of atherosclerosis and its risk factors as expanded exponentially. We now understand that stroke is but one of the final clinical outcomes of a prolonged sub-clinical course of atherosclerosis and “hardening of the arteries”. In a recent article from Stroke, Stein and colleagues present results from MESA; a large prospective Multi-Ethnic Study on Atherosclerosis. They evaluate the prevalence, cause and progression of subclinical cerebrovascular disease in a population based cohort of 6,814 men and women aged 45-84. They found that age and the use of antihypertensive medications at baseline, independently predicted arterial stiffness over time. Adding antihypertensive medications improved distensibility coefficient (DC) and the Young’s elastic modulus (YEM) of the right common carotid artery which was measured at baseline and follow up exam. For all ethnic groups, the rate of progression of YEM and DC showed no significant difference. It is noteworthy, that whites had a higher DC (better) at baseline than other ethnic groups and blacks had a higher YEM (worse) at baseline than other ethnic groups. This observation is an important one, especially as it relates to the well known race-ethnic disparities in the effects of hypertension and stroke. The implication is that hypertensive effects on the vessels begin well before the age of 45 in our African American population. Encouraging us as medical Practitioners to screen this group at an earlier age for hypertension and start treatment earlier. Beyond the effect of aging on the carotid artery, this paper provides insight into the biology of how our vessels respond to hypertension. One can see how YEM and DC can readily fit in a clinical module for management of our hypertensive patients. Imagine, your patient presenting to clinic; rather than making a decision on one blood pressure reading in your office we can measure the DC and YEM at baseline and follow its improvement over time. We can follow the response in the DC to the start of antihypertensive and anticipate the worsening of the DC if these agents are stopped or our patient has poor compliance. If these tools become clinically available (rather than as a research tool) YEM and DC could become to hypertension what HbA1c is to the management of diabetes. Mexico is an upper middle-income country (GDP $1.178 trillion) with 121 million inhabitants. It has a long tradition of implementing public health initiatives and now has universal health care coverage. The life expectancy at birth is 77 years. But almost 20 years after the publication of the NINDS tPA study, <3% of patients with a stroke are treated with lytics or other acute interventions, despite the fact that 24% of patientsarrive to the hospital within 3 hours of onset (almost half get to the hospital within 6 hours.) As in many other countries, including the US, many factors contribute to this low treatment rate, including a fragmented health care system, the lack of a coordinated EMS and in-hospital response, unavailability of lytics in some hospitals, limited access to imaging, poor knowledge of stroke signs and symptoms among the general population, and physicians’ fear about the risks of acute stroke treatments. Small unruptured aneurysms – a new pipeline for flow diverting stents? The Pipeline Embolization Device (PED) is a stent designed for insertion across the mouth of an aneurysm. It diverts cerebral blood flow and promotes aneurysm occlusion often without any adjunctive coiling. PEDs offer benefits in terms of reduced procedure times and possibly higher rates aneurysm obliteration when compared to coiling. The FDA, however, has approved the PED only to treat large and giant wide-necked aneurysms in the cavernous or superior hypophyseal ICA. Interventionalists remain leery of clinical PED use in other types of aneurysms due to lingering safety concerns. In this article, Chalouhi and colleagues seek to allay some of these fears. The authors performed a case-control study in patients with small (<10mm), unruptured, saccular aneurysms in the anterior circulation. 40 patients treated with one or more PEDs were matched in a 1:4 ratio with 160 patients treated with stent-assisted coiling based on age, aneurysm size, aneurysm location, and gender. The authors found similar procedural complications rates (5% with PED, 3% with stent-assisted coiling, p = 0.7) and clinical outcomes (mRS ≤ 2 in 100% with PED, 98% with stent-assisted coiling at follow-up). Those receiving PEDs had a trend toward higher rates of aneurysm obliteration at follow-up (80% with PED, 70% with stent-assisted coiling, p = 0.2). This is the first study directly comparing flow-diverting stents with stent-assisted coiling to treat small, unruptured aneurysms. The results are encouraging and provide preliminary evidence that PEDs may have a similar safety profile to stent-assisted coiling in this patient population. A few caveats to opening the pipeline to widespread PED use in this population remain. The average follow-up in the PED group in this study was only 7 months and PEDs are known to have a higher risk of delayed aneurysm rupture and stent migration. This study was performed at one site with a great deal of clinical experience; whether these low complication rates generalize to other treatment centers remains uncertain. It should be stressed that the risk of subarachnoid hemorrhage with unruptured aneurysms < 10mm is fairly low, with most studies estimating a rate < 1% per yr. Therefore even low complication rates may negate the benefit of intervening on these patients. Calouhi and colleagues provide encouraging results on the safety of PED use in this patient population. They lay the groundwork for future trials involving multiple centers and longer follow-up to determine whether more widespread use of PEDs is appropriate for treating small unruptured aneurysms. In ischemic strokes, clot length impacts the effectiveness of IV tPA. Kamalian et al. sought to determine the distribution and predictors of clot lengths in consecutive anterior circulation proximal artery occlusions. They retrospectively analyzed thin-section non-contrast CT (NCCT) of anterior circulation strokes, involving the internal carotid (ICA), middle cerebral M1 and M2 arteries. Through multivariate analysis, they showed that occlusion location was the strongest predictor of clot length. Clot length was >8mm in 94%, 73%, and 22% of ICA-terminus, M1, and M2 occlusions, respectively. They concluded that 1) the majority of anterior circulation proximal occlusions are >8mm long, 2) ICA-terminus occlusion is an excellent marker for clot length >8mm, 3) Thin-section NCCT appears useful for patients with MCA occlusion due to the wide variability of clot lengths. In essence, the authors have utilized NCCT to identify a biomarker for IV-tPA resistance in the setting of anterior circulation stroke. Although a hyperdense thrombus was reportedly visible in 96% of patients, their patient selection was unfortunately biased by excluding anterior cerebral artery strokes, albeit a small fraction. In addition, I’ve learned that “hyperdense” areas are not as synonymous with “clot length”. It is expected that when an artery, such as proximal M1, is occluded then there will be static blood along its whole distal segment until it meets a collateralized branch. For this reason I raise the following question to the authors: How did they distinguish static blood from “clot” ? Perhaps the location of occlusion is more meaningful. Nonetheless, this finding may have important implications in selecting appropriate patients for intravascular intervention such as intra-arterial tPA and thombectomy. Mirror, mirror on the wall, is priming helping stroke patients to recover faster? Stinear et al. conducted a single center controlled randomized trial, recently published online in stroke, to evaluate the hypothesis of promoting re-balancing of cortico-motor cortex excitability, which in turn leads to accelerated upper extremities recovery post stroke, utilizing bilateral priming with active-passive movements before upper limb physiotherapy. This study shed a light on a key question, as the recovery of the upper limb function is a predictor of the ability of living independently post-stroke. Patients, a total of 57, in this prospective controlled and randomized trial were randomized during the sub-acute phase post-stroke to either a priming group, who received a device-assisted mirror symmetric bimanual movements every weekday for 4 weeks, or a control group, who received intermittent cutaneous electrical stimulation of the paretic forearm for the same period of time. Assessment at 6, 12, and 26 weeks, measured with the Action Research Arm Test showed that the priming group were 3 times more likely than controls to achieve their recovery plateau by 12 weeks. Also, primed participants had greater re-balancing of cortico-motor excitability than controls at 12 and 26 weeks and inter-hemispheric inhibition at 26 weeks. In short, this trial suggests that patients who receive bilateral priming using device-assisted mirror symmetric bimanual movements have a faster recovery of upper extremity function in the initial weeks post-stroke, which will lead to a better chance of living independently. This is yet to be proven by larger scale randomized trials. Carotid stenting lost the revascularization battle to carotid endarterectomy largely due to increased 30-day risk of stroke and death, as demonstrated in ICSS (international carotid stenting study). In an MRI sub-study of ICSS where pre- and post-procedural MRIs were compared, stenting (CAS) patients had more (3x) new DWI lesions compared to the endarterectomy (CEA) group. What was the role of hypoperfusion among these patients? In this analysis of the ICSS-MRI substudy, Bonati et al counted the number and volume of new DWI lesions POD#1-3 and looked for associations with “hemodynamic depression.” This was defined as periprocedural bradycardia, asystole, or hypotension requiring treatment. The group found that there were more DWI lesions among patients with hemodynamic depression undergoing CAS rather than CEA. There was no difference in DWI lesion volume. The pattern of the lesions may be available in the supplement, but not available to me for review. There were no functional outcomes studied. Why wasn’t the effect of hypoperfusion seen among CEA patients? It’s unclear to me, but perhaps this is a compounded effect on top of the intrinsic risk of stroke from the CAS procedure. Other determinants of stroke may also be present (but not studied) since the number of patients undergoing CAS with higher DWI lesions was more than those who had hemodynamic depression. Despite limitations to this study, the results do re-emphasize the importance of maintaining blood pressures during and after CAS. Though I don’t know when the exact hypoperfusion is happening, I wonder if standardizing use of neuroanesthesia with intraoperative monitoring would help ensure adequate functional perfusion during the procedure itself. Afterwards, we and our vascular surgery colleagues, must ensure stringent monitoring of MAPs and attention to keeping the patient closer to their pre-op baseline. There are too many cases of both CEA and CAS where we walk in on post-op stroke codes and the MAP is >60 but the patient lives closer to MAP>80. What do you do at your institution to avoid post-procedure hypotension in your carotid revascularization patients? Sheth et al. recently published the pilot trial of glyburide for acute ischemic stroke (AIS). This study is a safety and feasibility study performed on ten patients at two academic centers. 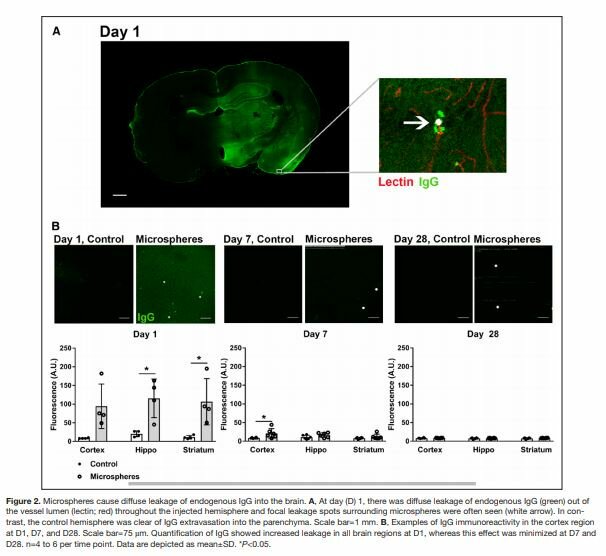 The rationale behind glyburide for AIS is that the sulfonylurea receptor 1 (SUR1) and the transient receptor potential melastatin 4 are upregulated in acute ischemia, leading to osmotic swelling from the uptake of sodium and water. Glyburide acts on the SUR1 receptor and is an inhibitor, therefore acute intravenous administration may reduce edema acutely. In this phase IIa trial, the rates of recruitment and the ability to manage blood glucose levels with administration of IV glyburide were assessed. Subjects to 18 to 80 years old with a DWI infarct volume 82 to 210 cm3 who were less than ten hours from stroke onset were included. It was exciting that there were no instances of hypoglycemia reported and that recruitment rates were higher than expected. Glyburide seems feasible as an acute treatment of stroke and future studies will need to assess the efficacy of the treatment. Based on historical controls, the subjects had lower increases in hemispheric volumes after stroke. The authors correctly point out that there is an urgent need to bring this therapy to larger scale trials to see if it can improve post stroke outcomes and functional recovery.